In Sailing World Senior Editor Stuart Streuli’s blog about his experience as jib trimmer on Phil Lotz’s Swan 42 Arethusa, the winner of last year’s NYYC Invitational Cup, he cites the practice plan laid out by the incomparable Ken Read as the primary reason for their win in the ultra-competitive international field. BMW Oracle Racing and Alinghi spent months training for a best-of-three series. 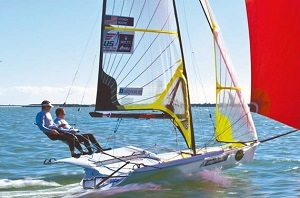 In my 49er sailing, my crew Trevor Moore and I train upwards of 100 days per year in our campaign for the 2012 Olympics as members of the US Sailing Team AlphaGraphics. Racing is important, but it’s key to make time for training. When done right, training can be highly effective and FUN! With a concrete goal in mind, the most important step to quality training is to have a plan. Once on the water, constant review and repetition is key. Afterwards, revisit and discuss so that improvements made can be put into effect at your next regatta. Set your Goal and Identify your Weakness! The first step to training is to identify what it is you are training for. On every sailor’s schedule, you should be able to circle a “peak” regatta. Sailing the 49er, we have highlighted two regattas this season as our peak events. Of course, we want to put our best foot forward at every event we sail, but in the events leading up to our peak regatta our primary focus is on improving a specific area of our game. Focus on the scoreboard is saved for peak regattas. Now that you have your peak regatta circled, set a goal. While many goals in sailing should be focused on techniques and not results, a peak regatta is a great place to set what we call a “number goal.” Goals should be optimistic, but reachable. In setting your goal you should be able to highlight some of the areas where you need the most practice. Think back to past events of a similar caliber to your peak event. Consider where you may have given up the most points around the racecourse. Be specific. For example, many sailors have trouble with starts. Well, “starts” is a big topic. Is it your approach to the line? Holding your spot? Acceleration? Pick just one aspect to tackle. Now that you have identified your most glaring weakness, try to estimate how many points you could have saved at recent events by simply improving 15% in that area. Add up those points throughout an entire event, and set your number goal for your next event. OK, we have a goal, and we have identified just one aspect of our game of which minor improvement will greatly increase the achievability our goal. The next step to productive practice is to set a schedule. This will vary significantly from program to program, and there is no right or wrong method. In scheduling your training days, remember a few important things. First of all, quality over quantity! One efficient, focused weekend or half-day of training can far outweigh multiple weeknights thrown together haphazardly with no focus or lots of different crew. That broaches the next important thing about planning practice; it’s crucial to have as many members of the race team aboard when practicing. Everyone’s job is important, and everyone needs practice! Finally, schedule your training in advance enough of your event that you can put your improvements to use in racing before your peak regatta. Make a Plan and Get on the Water! Coaches, training partners, turning marks, photos, and video are all valuable training tools that we use extensively in our training on the 49er, but none are fundamental to effective training. Once on the water, the only necessity is focus on the task at hand. Let’s return to our starting example. Suppose the problem is trouble with accelerating up to full speed at the start. Practicing alone, do acceleration after acceleration. At first, do it away from any marks. Go through the motions as if it were a race, timing how long it takes to get from down speed to full speed and closehauled. Be mindful of not eating up too much lateral space that you will not have on the starting line. Continue with the progression by lining up near a crab pot or mooring, using it as a target so as to refine your judgment of time and distance. Remember to take time to critique yourself and your teammates throughout the process, highlighting what works well and what can be changed. When done with an open mind, this step by step dissection of a very specific aspect of the game can yield tremendous results, and it’s fun! Seeing oneself get better at something in a short period of time can be incredibly rewarding. Review and Put it into Practice! Everything we’ve covered has assumed no presence of a coach. While hiring a coach for a single session or for multiple consults, a self-critical team can make huge strides without one. This begins on the water, and continues on shore. Go over the improvements made on the water and how to implement them on the racecourse the next time out. I like to make notes after each debrief, which helps me with retention. There are many different approaches that work; as long as you are a good “student” of the game, you will see marked improvement. So, at your next peak regatta, be prepared to avoid frustration, have some more fun, and meet your goal. All it takes it to go sailing with a plan, an open mind, and no score keeping!